You want to make the most out of your time in Paris but don't know where to start? Have a look at our Paris must visit place list! No matter how cliché it sounds, Louvre Museum is a must visit place when in Paris. Not only because the museum includes has some of the most well-known paintings of all time but also because it is one of the most predominant museums in the world that tries to contribute to the art world in the best ways possible. Louvre Museum, built in 1190 as a fortress but started to be used as a royal palace in 16th century. Today it is the largest museum among all the others in the world and has got more than 35.000 art pieces. The collection includes pieces from Greece, Egypt and Roman Empire as well with modern paintings and sculptures. It is claimed that if you spend only a minute in front of all the pieces, it takes more than 3 months to complete the tour. Louvre Museum is a place to spend a whole day if you would like to see as much as you can, but if you are short of time, make sure you download a map of the halls before you visit and mark the pieces you want to see beforehand. You will probably welcomed by a long queue at the entrances if you don’t go early in the morning. However people claim that the entrance at the subway has relatively smaller number of people waiting outside. 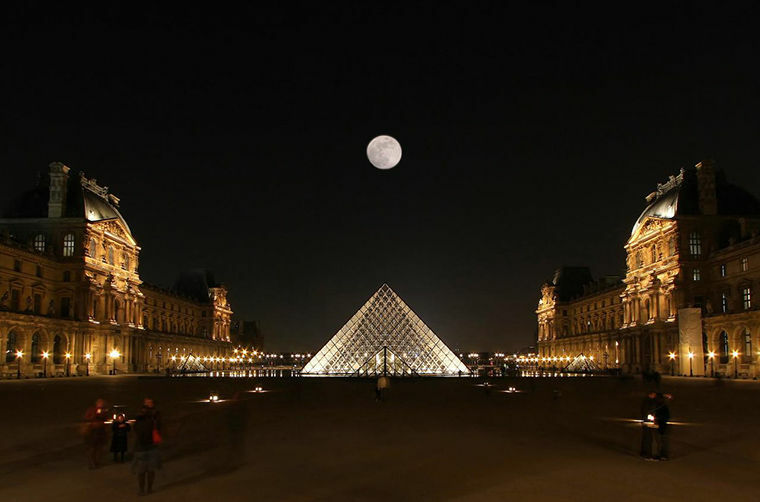 In addition, on Wednesdays and Fridays, Louvre accepts visitors until 9 P.M.
A visit to Notre Dame de Paris is probably going to change what you know of cathedrals. Located on the eastern part of Île de la Cité, this magnificent example of gothic architecture has been fascinating people for a long time and still remains as the city’s sacred place. The building process and the following incidents that affected the cathedral, the vandalism against it and the renovations are all as sensational as the building itself. It is not hard to understand why, the great French writer Victor Hugo decided to write a novel that is centered on Notre Dame. Saying that, Notre Dame de Paris is a place where you should definitely get to know more of. If you decide to visit this 800 years old breath taking land mark, it is recommended you take a tour with a guide, speaking your language. You can get more information about the opening times and the tour options from the official web site of Notre Dame de Paris. Another icon of Paris is the Arc of Triumph, the massive monument that is dedicated to the people who fought the French Revolutionary and the Napoleonic Wars and lost their lives. Located at the end of the famous Champs-Élysées, this breath taking monument was built with the order of Napoleon and it is believed that he was inspired by the Arch of Titus which belongs to the Romans. The construction was halted during his abdication and completed in 1836, after 30 years. It is still one of the most visited places of the city and definitely is worth a visit. The official website of Arc of Triumph is packed with all the information you may need to visit this wonderful mark of history and get to learn more about it.